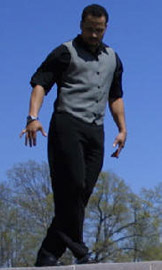 Bernard Martinez is a choreographer, coach, performer and instructor of salsa/mambo, cha-cha and theater arts. With over 9 yrs. of teaching experience, Bernard's teaching style is technical and flavorful - filled with creativity and musicality. Bernard specializes in men & ladies styling, partnering and shines, on 1 and on 2. Bernard is also a salsa/mambo promoter, event organizer and professional DJ. In NYC, Bernard is the founder and director of "MamboCaliente Nights" held regularly since 1999. His instruction methods are uncomplicated and easy to follow; emphasizing fluid lines and utilization of his own technique called the 'Economy of Motion'. This technique is based on logical motions to efficiently maneuver based on the flow of energy, connection and spacing, thereby utilizing the weight change in completing each combination or turn pattern. This technique allows more time to style or play with the music while creating beautiful lines for both leader and follower. Bernard offers this and many other techniques and pointers in his instruction. Studies include: theater arts, jazz, east coast swing dances and martial arts. MamboCaliente teaches on2 and their dance products are available on Zone Free DVD.